The Orlando area is well known for its theme parks, including Disney World Resorts and Universal Studios, but it's also known for its many animal attractions and natural wildlife parks. From the collection at Disney's Animal Kingdom to the annual migration of manatees at Blue Lake State Park in Orange City, there are plenty of chances to see animals on your trip to central Florida. Although Orlando experiences year-round warm weather, keep in mind that some animals do hibernate during the winter months, and some attractions may be closed part of the year. Be sure to visit each venue's website for more information on season hours of operation and any fees associated with admission. Walt Disney World's Orlando zoological theme park Animal Kingdom features animals from every continent of the world. In typical Disney style, the park also features rides, shows, parades, and themed restaurants including the Flight of Passage ride, Na'vi River Journey, and the Satu'li Canteen restaurant, all in honor of the hit film "Avatar." At Disney's Animal Kingdom, you can encounter African birds and elephants, butterflies, gibbons, ​giraffes, gorillas, hippopotamuses, lions, migratory birds, okapis, rhinos, tamarins, tigers, and vultures. 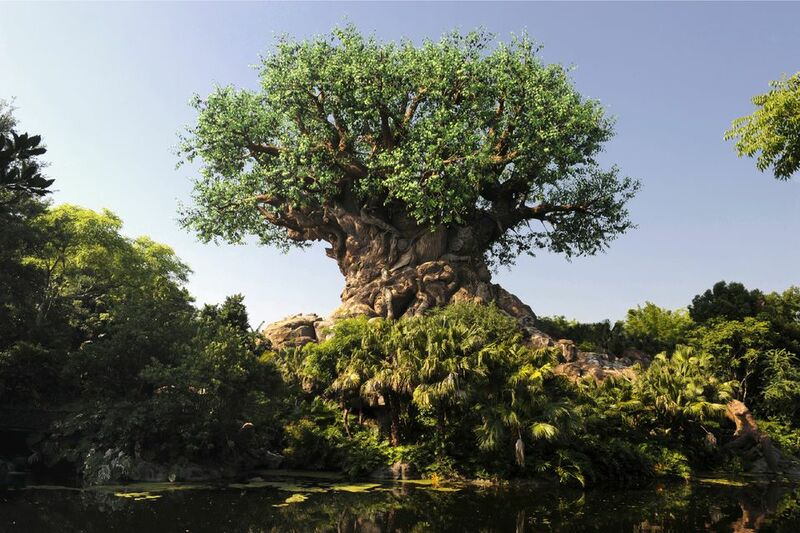 The popular Tree of Life is an iconic feature of the park, and you can enjoy a number of great attractions like Fossil Fun games, Discovery Island Trails, and the Conservation Station interactive exhibit. Orlando's premier aquatic theme park, SeaWorld Orlando, offers rides to thrill and unbelievable attractions, inviting guests to "see ocean life like never before." At SeaWorld Orlando, you can watch trained animals perform or spend the day on one of the park's many amusement rides. Florida residents can take advantage of resident specials, and visitors of all types can partake in fun annual events. The theme park and roller coaster side of the park has some of the best rides in the city. You can ride the Infinity Falls rive ride, taking a harrowing plunge off the tallest drop in Orlando. The amusement park also features the tallest, fastest, and longest coaster in central Florida, Mako. The Central Florida Zoo and Botanical Gardens is an animal sanctuary, education center, garden, and attraction all rolled into one. At the Central Florida Zoo, you come face to face with intriguing animals from around the globe. There are over 400 animals and 150 different species at the zoo, and you can even get up close and personal with some domestic animals at the Barnyard Buddies Children's Zoo or during the daily feeding of the giraffes. The zoo also offers seasonal events year-round including special holiday celebrations. Additionally, summer camps and educational programs are a great opportunity to learn more about the animals at the zoo, and you can even host your kid's birthday party at the facilities. Gatorland is the area's original theme park attraction and has been entertaining visitors with its animal park in Kissimmee since the 1940s. Owen Godwin founded Gatorland in 1949 and the company is still owned by his family today. This 110-acre wildlife preserve calls itself the "alligator capital of the world" and features alligators and crocodiles of all ages and sizes, including babes (known as grunts) and several 14-foot gators that live in the Breeding Marsh. The attraction isn't just about gators, though. Gatorland also has a free-flight aviary, trained animal shows, the Screamin' Gator Zip Line, the Stompin' Gator Off-Road Adventure, and a petting zoo. A cross between a water park and an animal attraction, SeaWorld's Discovery Cove invites you to swim with dolphins, rays, and tropical fish. In addition to the star attraction bottlenose dolphins, the park also has an incredible collection of Southern and cow nose rays,10,000 brilliantly colored tropical fish, fearsome barracuda, and sharks. The park also features a free-flight aviary with more than 25 exotic birds. Alternatively, you could spend the day on the Wind-away River, whose lush landscaping is a refreshing take on the classic "lazy river" of other waterparks or check out one of the many simulated reefs teeming with ​aquatic life. From November through March, Blue Springs is home to the West Indian Manatee as they leave the cold ocean waters for a warmer winter home in the springs with its constant 72-degree waters. For those brave enough to attempt the 72-degree springs on a winter day, snorkelers and scuba divers can capture some unique pictures of the West Indian Manatee. Boat tours, camping, fishing, swimming, tubing, and hiking are available during the spring through fall months (when the manatees aren't present). However, you are not allowed to swim or dive with manatees outside of the designated swimming season, a rule which is strictly enforced. You can speed across the waters of Lake Jessup in search of animals in the lake and marsh with Black Hammock Airboat Rides. Lake Jessup is home to one of Florida’s largest populations of alligators, so you'll be sure and see some up close. You'll also encounter pelicans and turtles. The jet boat slows down as it takes you around historic Bird Island, situated in the middle of the lake, where you can see birds such as herons, ibises, cormorants, and kingfishers. The facility at the dock houses a sanctuary where you can see baby alligators. Just outside of Orlando, you can go horseback riding through the Forever Florida conservation area with a guide/naturalist. Horses are available for all skill levels so everyone will enjoy the ride through the natural terrain of cypress, palm and oak trees. You'll be likely to see turkeys, hogs, cows, and deer as you ride. There's a boardwalk where you can walk out to see swamp life and an alligator or two.